I may have written about this embarrassing video of me when I was a child, so excuse me if I happen to repeat myself after five years of blogging since it ties quite nicely into this product review. In the mid-80’s, it seemed that EVERYONE was buying video recorders because for the first time they were cheap, mass-produced, and as we now know today, people LOVE making videos of themselves. My parents were too cheap (or just didn’t have the money) to buy one, but my grandfather did. AND HE RECORDED EVERY OCCASION when we got together…which was mostly holidays. He’s put his video recorder on a tripod and hit record for HOURS and it probably started from the time I was six or seven. A few years ago, my brother ended up taking some of his VHS tapes and converting them to DVDs and sent me a copy of some of these massively long videos. I couldn’t sit and watch each painfully long videos from start to finish so I started fast forwarding most of the videos – and WOW – I couldn’t help but notice that I was like Tigger from Winnie the Pooh. I was constantly in motion, bouncing up and down and rocking back and forth as if I was in my own little heavy metal rock band sans the music. At first I was embarrassed, and then I became thoughtful. I couldn’t help but think that if some therapist had saw those tapes, I’d instantly be put on medication for ADHD. It was eye opening. Now that I have a soon-to-be first grader, I realize the apple doesn’t fall far from the tree. While Brooke gets her work done, is smart as a whip, and quite a normal bouncy girl, she is very fidgety. My thoughts of kids having high energy changed when I saw myself on tape; kids have loads of energy and we expect little ones to sit quietly and work throughout each school day as their recess time keeps getting cut down in public schools. It’s no wonder teachers can find their children bouncing off the walls and somehow we have become a nation that is quick to medicate children. Thankfully, in Brooke’s school, her kindergarten teacher had some other ideas on how to help her students focus and learn by soothing their hyperactivity through something called chair bands. 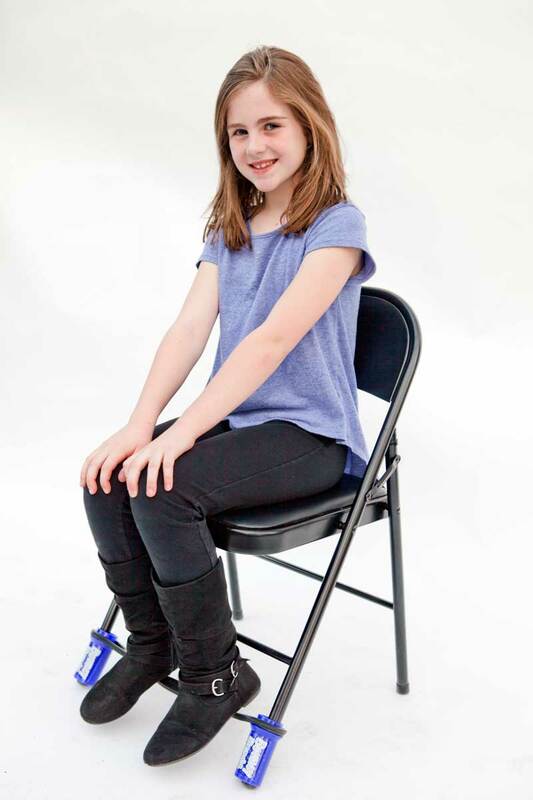 Since school budgets, especially Brooke’s school which is a Charter, is not designed to pay for such resources within their budget, so her teacher suggested these chair bands as a ‘wish list’ item for her students. I immediately started to research and learn more about them because I wanted to help Brooke and her classmates learn how they can fidget without distracting others. Bouncing Bands have opened my eyes to the possibilities and resources that are out there for students AND adults to use so they can ‘wiggle while they work’ and focus more on learning than on bouncing. Awesome! Move while you work quietly. Makes learning and working fun! Discreetly soothes student anxiety, frustration, and hyperactivity. Bouncy Bands for Chairs are made with heavy-duty rubber. The Bouncy Bands for Chairs can be used with the small Kindergarten chairs and they also stretch to fit adult chairs. They can stretch to fit chairs that have a distance from 13-18″ between the chair legs. Check it out! Watch this video on how to install Bouncy Bands for Chairs. I’m happy to report that Brooke loves her Bouncy Band. 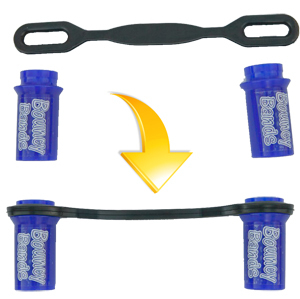 Not only that, we also learned that you can get Bouncy Bands for Desks, too. 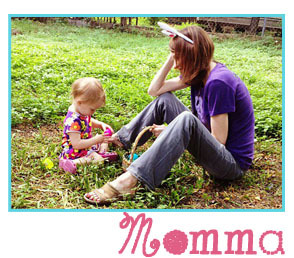 Bouncy Bands are made in the USA and supported by Able Play, Mind Spring, and Creative Child. This isn’t just a product for students with ADHD (which, I will add, Brooke DOES NOT HAVE), I learned many young students need a product like this because they are just high energy at that age. With limited outdoor recess and gym class in public schools, students are often misdiagnosed with hyperactivity when they are just being their bouncy kid-selves. Also, the need for Bouncy Bands doesn’t just stop at childhood, many adults suffer from restless leg syndrome, or need to move their legs while sitting in cubicles due to deep vein thrombosis or have diabetes and need to increase their blood circulation in their legs. I’m also thinking of getting one for myself because I do have anxiety issues where I bounce my legs up and down most of the time when I am sitting. If this product helps students have better concentration, relieve anxiety, and lead to better learning and test scores, I’m all for making Bouncy Bands a mandatory line item in our school’s budgets, but for now, our teachers asking parents to help their students with their own ‘wish list’ items like Bouncy Bands is a wonderful way to get the ball rolling in educating our students who don’t have as much play or down time as we did as kids. And that – my friends – is a much better solution than looking towards Big Pharma. Just my two cents!